One of the drawbacks to being an active lower Grade cricketer is that you miss some important milestones in 1st Grade of players you respect and are also friends with. Last weekend, Sam Wolf came through with arguably the bowling spell of his career, snaring his first five wicket haul in 1st Grade. His 5/25 spanned a 17 over straight spell. All five wickets were top order batsmen. It is a mark of the continued maturity of Sam Wolf the Cricketer, that this was possible. Playing a Jamberoo side that contains batsmen that, though perhaps not out-and-out sloggers, are capable of some hard cross-bat hitting, on a ground that is intimidatingly small for a bowler if you are not on song, it takes patience and a good line and length to pull off bowling figures like those that Sam returned. Three seasons ago, Sam was a good 3rd Grade bowler, knocking on the door of 2nds, but he had some control problems. He made his 1st Grade debut that season, eventually being ordered out of the attack after 1.5 overs against Warilla for continued head-high full tosses (I think that is the polite way to phrase it). He finished the season in 3rd Grade, with half the wickets at almost twice the cost as he had achieved in the previous season. Something had to change. The following season, Sam's work ethic at training and in cricket in general picked up dramatically, and the results showed. He played the entire season in 2nd Grade, apart from one match in 1sts, and finished with 32 wickets at 14 for the season. His bowling had improved out of sight, he was staying taller in delivery, and his line and length had become good enough to trouble the best batsmen 2nd Grade could provide. Last season, Sam graduated to 1st Grade on a full-time basis. Though 18 wickets at 26 doesn't sound impressive, it is the knowledge he gained from playing the entire season, being able to watch what the other 1st Grade bowlers did to take wickets, that was invaluable. And now, the benefits are obvious. In just the 3rd match of the season, Sam now has 11 wickets at 11, has become the opening bowler Kiama needs, and the foil that 1sts need when Josh Jones returns to the fold. No one now trains harder, or works harder at their game, than Sam Wolf. No one is more enthusiastic or passionate about the Kiama Cricket Club. He has assumed the mantle of leader of the Club's Victory Song, and he guards it with both honour and glee. No doubt in his own mind, and most certainly in the minds of his 1st Grade opponents, he has now graduated as a 1st Grade Bowler. It was a shame not to be there to share it with him. It is a rare event when it can be said that Kiama have won all four Grades, but the past weekend was one of them. They were of varying degrees, against varying opposition. Comparing them, one may get a glimpse of what lies ahead. 1st Grade's victory by an innings over Warilla is one that should be celebrated to the maximum, and used as evidence that the team combination is heading in the right direction. Much has been said of the lack of success our Club has had against Warilla, and needs not be repeated. In the end, the victory was an emphatic one. Having said that, the opposition are acknowledgably at their weakest in memory. Historically, Warilla have fought between themselves on and off the field, but always pull together (in a manner of sorts) when required to gain victory on the field. Now, it appears, they are unable to summon up that ability at will, which makes them vulnerable for the remainder of the season. Up against a Kiama side that is as well drilled as any that I can remember, Warilla were simply unable to match their enthusiasm and spirit. It is important for 1sts to continue to build on their impressive start, and not get caught taking opposition for granted. The next two matches are against perennial finalists Jamberoo, and big improver of the past two seasons Lake Illawarra. In four weeks time, the story may be heading towards that happy ending. 2nd Grade had the distinct pleasure of not only rolling Warilla for just 95, but of asking them to follow on. That was where the joy really ended, as Warilla batted out the day to finish at 7/250, and some of the gloss of the first innings points was taken away with it. Though the win made up partly for the first round loss, it also emphasised that 2nd Grade this season do not contain the firepower they have had in recent seasons. There is a sense in the team that it is building up to that, and that the side will be right in the mix come finals time. Yet, with only 12 rounds scheduled in the 2nd Grade competition, and one of those a bye, one slip could mean the difference between playing finals and watching from the sidelines. Losing to Shellharbour, and the inability to force the outright against Warilla are both equations that would have been reversed in the past 2 seasons. 3rd Grade completed an easy outright victory over the hapless Rail Red side, which gave them the best possible start to the season. It's interesting to hear around the traps that 3rds are 'almost certainties' to win the premiership this season. Without attempting to compare this season's side to any other, it must be remembered that last season 3rds were undefeated at Christmas, and only just snuck into the top four. Three seasons ago, Kiama fielded what I consider to be the best ever 3rd Grade side our Club has put on the paddock – and they too were defeated in the semi-final. There is a hell of a lot of cricket to be played between now and March. No matter what the quality of the players available to 3rds this year, they still have to combine as a team, and win the important games. The Rail is not a good guide. Albion Park and Oak Flats will be the guides as to the fortunes of our 3rd Grade aspiriations this season. 4th Grade started their season with a victory, again against The Rail, and got good contributions from their young brigade. Eric Mete, Ben Runge, Matt Cook, Mitch Formosa, Grant Regan and Dave Tobin all did good things, and is a promising sign for the side during the coming season. Most of this side played together last year, and are developing nicely as a squad. One would not expect it to be too long before some, if not all, of these guys are gracing the field in higher grades.And that is the big picture with 4th Grade. Winning games will be great, but the development of the players in the side will be ever so much more important. While the weekend saw a lot of good news for the Kiama Cricket Club, it did contain perhaps two of the best stories in individual performances, both of which have probably been coming for some time, and both of which were from opening batsmen. Dale Scifleet has threatened for the past couple of years to break through and translate his obvious talent into runs and wickets. At a time when Kiama Cricket needs him to do it the most, it looks as though he may finally have taken that step. Kiama 1sts were jumping on Saturday, having finally broken a 15 year hoodoo, and taken 1st innings points in their clash with Warilla. In the midst of this achievement stood the growing colossus of Dale Scifleet. Coming on as first change as 1sts attempted to dismiss the Kookaburras, Dale snared 3/23 with his increasingly improving bowling. Dale has always shown himself to be a bowler with an ability to bowl quick, though unfortunately his frame has sometimes been unable to cope with that strain. For the first time since he was 16, he now appears fit and strong enough to cope with the demands he places on himself in delivery. With no rest for the wicked, Dale, having helped decimate Warilla for just 98, immediately straps on his pads, and walks out to open the innings for Kiama's reply. He is in form, having scored 65 not out in the first match. Now, however, he must do it against one the competition's historically striongest teams. Though two early wickets fell, Dale is resolute, and with his skipper, they steer Kiama past the mental barrier imposed for so long. From here, the job is not finished, Dale bats on, dominating the attack, until, like Kiama batsmen in the nineties before him, he cuts a ball on to his stumps, prematurely ending his innings on 94, when a maiden 1st Grade century beckoned. What does it all mean. From the sidelines, what it means is that Dale has finally found himself as a cricketer, managing to meld the talent with the work ethic on and off the field that is required to succeed. His selection for South Coast is testimony to that, and the possibility of reaching Southern Zone and, maybe, Country, would be an extension of that. More than anything else, Kiama's great hope for the past six years finally appears to have materialised, and with it, 1st Grade's best chance for success in many years. A few kilometres away, at Bonaira Street, another prodigal was making a mark of his own. Simon Pearson seems to have spent the last few seasons in the shadows, appearing briefly in the higher grades, but generally forced to work his trade in 3rd Grade, where he was playing on the weekend. After his skipper had won the toss and decided to bat against The Rail Red, Simon strapped on his pads and walked out to face the music. The side was loaded with faces that, in talk at the Grand, were expected to do the real damage. But while Savage, Wills, Gunning, Bombaci, Park and Lawler made their contributions, Simon played as he always does, accumulating his runs without anyone realising how well he is going. Playing at Oakleigh Park, I had an indication that he was doing well by the frequency of the phone calls from his father, Ian. The final one came at around 4.30pm, when Ian could barely contain his glee by announcing, “Simon made his hundred, and I was there to see it!”. Simon has been unfortunate that his chances in the higher grades have often been one-off cameo's, when others have been unavailable for a weekend. On his 1st Grade debut, he put his hand up for the Number 3 position against the toughest assignment in South Coast cricket...(and promptly shouldered arms to an inswinging rocket and lost his off stump). He has the ability to make a solid 1st Grade batsman, given the opportunity to stake a claim, and the desire to make it happen. These are just two of the stars from last weekend. The Warilla victory in 1st Grade may have drawn the headlines, but these two players have every right to feel very pleased with their start to the season. With all Grades getting on the paddock this weekend, we will finally get an indication as to how all of the Clubs are travelling in the new season. 1st Grade have a wonderful opportunity to charge away early in the season against recent powerhouses Warilla at Cavalier Park. Early indications are that the Kookaburras may well find the going a lot tougher this season, and 1sts must take advantage of that in the coming match. 1st Grade have an abysmal record against Warilla, having won only 5 matches out of the 45 played between the two sides since Warilla’s initial season in 1979/80 – the last victory coming on December 22, 1990. If Kiama are to move forward this season, they must overcome this to do so. 2nd Grade had a rough start; falling to an opponent they should have defeated comfortably, and will be looking to rectify that against Warilla at Oakleigh Park. 2nds will be in the mix again this season, but their charter has been reformed from recent seasons. Unlike recent times, the 2nd Grade side is expected to be filled with players who are aiming at playing 1st Grade, rather than with players who for one reason or another will not gain elevation to the top Grade. The selectors have been consistent in this attitude throughout the pre-season. It may affect the overall playing strength of the side, but it will certainly improve the long-term strength of the 1st Grade side, and this is what the Club must be aiming for. The match against Warilla, who are angling the same way themselves, will be the benchmark. Win the game, and the season is back on track. Lose the game, and the focus may change entirely. 3rd Grade has a wealth of playing talent to sift through and call upon as a result of 2nd Grade’s charter. The team for the weekend’s match against The Rail Red at Bonaira Street has an abundance of talent and experience, and must be seriously thinking about a maiden premiership. Containing players like Jason Wills, AJ Savage, Simon Pearson, Jeff Lawler, Luke Bombaci and Ryan Gunning, this side, if it stays together, should be one of the dominating sides of the summer. The Rail has two sides in the 3rd Grade competition this season, and if recent history is any guide, it should be a fairly comfortable victory to the Kiama side. 4th Grade will hope to reap the rewards of last season’s youth investment policy, by pushing for more victories, and the further development of the Club’s future. Most of the kids who played last season have returned for another crack, and no doubt the experience that they gained from last season will benefit them enormously. They face The Rail in their first match, and will be confident of putting a win on the board. The word from around the Club is to keep an eye on youngster Eric Mete. We shall see how his season progresses. So – away we go. The coming few weekends will soon tell the tale of how Kiama can hope to go this season. If they perform to their potential, it should be one of the most exciting in recent years. 3. Midnight Oil / 10, 9, 8, 7, 6, 5, 4, 3, 2, 1. 1982. 4/5. This was one of the first four or five albums I ever purchased, having first become intrigued by the singles being played on the radio and the music videos being played on "Sounds" and "Countdown". Even at that time of my life it was the hard rock side of music that was luring me in, and Australian pub rock was one of those things it was probably cool to listen to for a teenage male. 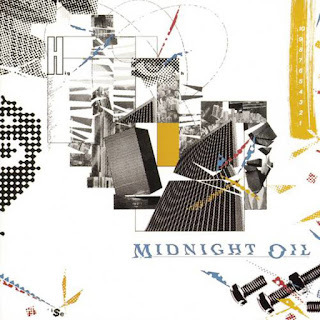 But, with the advent of videos, how could you not be drawn in by the fury that was Midnight Oil? Some of their most lasting anthems come from this album. Once I actually had the album, there was even more to it than that. The moody opening song "Outside World" really lulls you in, without even knowing with the keys and Peter Garrett's vocals strangely efficient. Its sereneness is followed by the more frantic and demanding nature of "Only the Strong", often leading to my being "locked in my room... and I just wanna screeeeeeeeaaaaammm!!!" whilst listening to it. The heart of the album follows, and it stacks up against the middle of any album ever recorded. "Short Memory", my all-time favourite Midnight Oil song "Read About It", "Scream In Blue", "U.S Forces" and "Power and the Passion" are all songs that everyone of Generation X know the words to - certainly in Australia. Just fabulous songs, all with their own message, and still all brilliantly enjoyable. They all still hold up as well today as when they were recorded 30 years ago. This is all a tough act to follow, and the end of the album for me suffers a little because of it. However, "Tin Legs and Tin Mines" still has quirkiness that makes it endearing. All in all this is one of the finest albums to come out of Australia. While some believe Diesel and Dust or Blue Sky Mining rank above it, this to me will always be Midnight Oils' finest moment. 2. The Beatles / 1. 2000. 5/5. This was a greatest hits collection released in 2000, containing 27 of their best songs. It may appear out of place amongst most of the rest of the albums that will be on here, but when you grow up with parents who grew up with The Beatles, you are going to be drawn along somewhat. It can't be denied that they were groundbreaking. 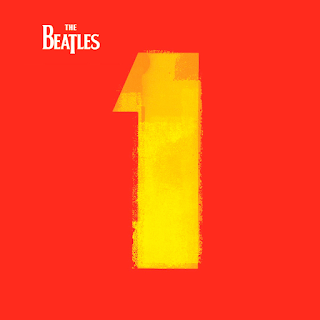 One of the things with The Beatles too, is that to say this is their definitive best of is open to personal opinion. There are songs missing for me, as I am sure there would be for most fans. I have always enjoyed their pre-experimentation years more than their later, non-touring session albums. Pure rock and roll pop songs like "She Loves You", "Can't Buy Me Love", A Hard Day's Night", "Eight Days a Week" and "Help!" have generally been my favourite type by the band. This being said, two of my absolute favourite Beatles songs are "Eleanor Rigby" and "Penny Lane", which certainly don't fit into this category. Everyone knows The Beatles. Everyone knows The Beatles songs. You may not love the band or their music, but you sure as hell know the words to most of their songs. It's almost a prerequisite in the modern music world. This collection does a pretty fair job of putting together their decade in one package. 1. 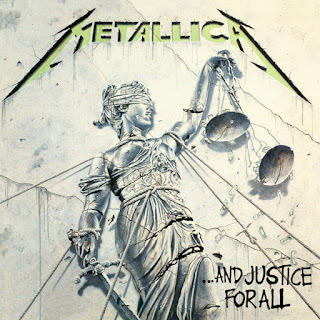 Metallica / ...And Justice For All. 1988. 5/5. Following on from three ground-breaking and all-time great metal albums, offset by the tragic loss of bass guitarist Cliff Burton, Metallica returned to the studio and produced an album that arguably outstripped them all. Let’s get through the negative from the outset. New bass guitarist Jason Newsted could just as well have taken an extra six months off for the effect he has on this recording. If he had been turned down in the mix any lower, then his amps would have been at -1, not 11. Turn the bass up on your stereo when you listen to the album. You get the bass drum ticking away like a metronome in your chest, but the bass guitar is still in the background. There can also be a case made for just how tight and exacting the instruments are on this album. Is it sterile as some have suggested, or just clinical? It's open to opinion and interpretation. There is no doubt that there is a much fuller sound on their album that follows this one, but does that make it better? In 1988, this was the bees knees. ...And Justice for All is a testament to the amazing growth in the band, to all that they had seen and learned in the previous years, both as artists and people. Hetfield's lyrics are cutting and concise, blisteringly brutal in places, much like the music that accompanies them. There is nothing friendly or polite here. Hetfield takes his thoughts and shoves them up you nose with force. Feel his anger at the stupidity rife in the world. It is a subtle as a blow from a brick to the head. Environmental issues ("Blackened"), injustice ("...And Justice for All"), the horrors of war ("One"), and even politely informing your parents of their wrongs ("Dyers Eve") are all covered here. It's not just the lyrical content that shines here. The progressive arrangement of the songs is amazing. as heavy as they are, the time changes and the arrangement of the song structures is ahead of its time, so far ahead of what any other metal band of any denomination was doing at the time. It was the benchmark for metal moving into a new decade. What can you say about one of the all-time classics. This album blew away even the metal world when it was released in 1988. It was just another step up from what Metallica had achieved before, and is a masterpiece. Arguments will always ensue as to the greatest Metallica album. Rest assured this is as close as you can get if you don't already believe it is. Almost without peer was the tour which followed this album. I can vouch that it still remains one of the best I have ever seen. It also became the turning point in Metallica's career. It was the close of the first chapter of their story. For many, it went downhill from this point. Others believe that the best was yet to come. Almost all will agree that this was a ground breaking classic.